The entire wedding party walking from Grace Restaurant in Portland, Maine. On a cool side note; the brides grandmother was also married at this location when it was functioning as a church. This venue has a lovely gothic feel of a time past mixed the contemporary furnishings of today. 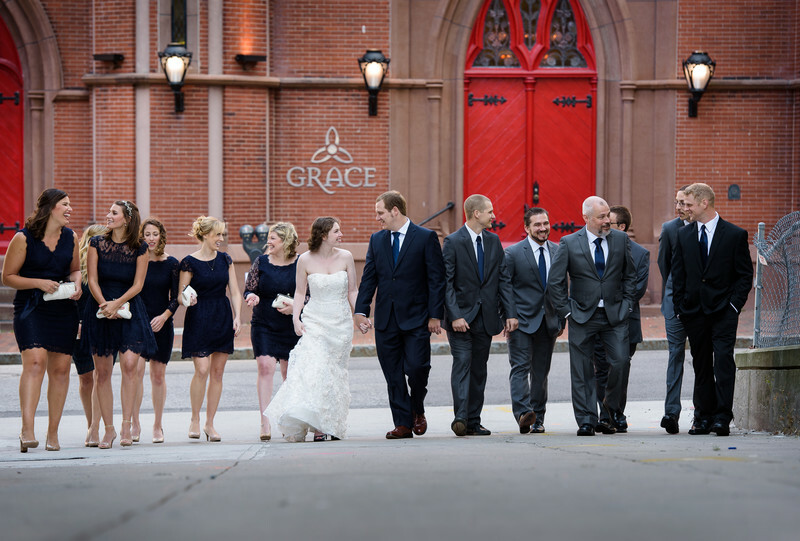 The brownstone façade and grand wood doors make for some great wedding photos. If you are looking for an interesting urban location in Portland Maine than look no further than Grace. It has impressive features and a wonderful function hall below the church for dinner and dancing all night long. Location: Grace Restaurant, Portland, Maine.